Laser marked .20 PRACT ejection port cover. Permanently laser marked on both sides so it is visible in open or closed position. Permanently laser marked on both side so .204 Ruger shows when cover is open or closed. Laser marked in .22 LR ejection port cover fits standard uppers. Ejection port cover is permanently marked with coyote in the scope on both sides so it is visible in open or closed position. 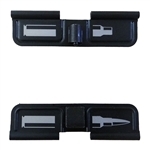 Ejection port cover is permanently marked on both sides so it is visible in open or closed position. 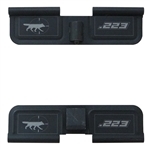 Ejection port cover is permanently marked on both sides so it is visible in open or closed position. Both side are permanently marked .223 REM so it will show when cover is open or closed. 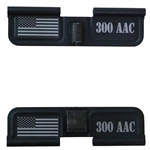 .300 AAC Blackout Ejection port dust cover with pin, clip and spring Ejection port cover is permanently marked on both sides so it is visible in open or closed position. Laser Marked .338 SPECTRE ejection port cover is marked on both sides so it is visible in open or closed position. Ejection port cover is permanently marked.40 Smith & Wesson and USA Flag on right on both sides so it is visible in open or closed position. Permanently laser marked .458 SOCOM ejection port cover is marked on both sides so it is visible in open or closed position. Ejection port cover is permanently marked with wavy USA flag and .223 on both sides so it is visible in open or closed position. 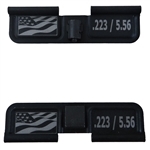 Ejection port cover is permanently marked with wavy USA flag and 5.56 on both sides so it is visible in open or closed position. Ejection port cover is permanently marked with 5.56 Blanks Only. For those building can cannon soda can launchers that require blanks this laser marked cover will add more obvious markings to the upper. 6.8 ARP is laser marked on both sides so it is visible when ejection port dust cover is open or closed. Double sided marking so 6.8 SPC is visible when ejection port cover is open or closed. Ejection port cover is permanently marked with wavy USA flag and 6x45 on both sides so it is visible in open or closed position. Ejection port cover is permanently marked on both side so 7.62 x 39 will show when cover is open or closed. 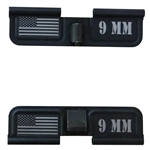 Ejection port cover is permanently marked with a USA flag and 9 MM on both sides so it is visible in open or closed position. Ejection port cover is permanently marked with Ace of Spades on both sides so it is visible in open or closed position. Ejection port cover is permanently marked with "Big .50" when closed and "Game Over". Since .50 Beowulf is a registered trademark of Alexander Arms we cannot make a cover so one of our customers suggested this cover design for their Beowulf, excellent idea! NOTE: this is only fits "standard / unmodified" 223/556 uppers. 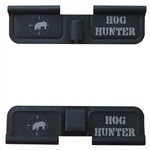 Ejection port cover is permanently marked with Feral Hog and 300 Blackout on both sides so it is visible in open or closed position. Ejection port cover is permanently marked with a Feral Hog and USA Flag on both sides so it is visible in open or closed position. Feral Hog and WYLDE is laser marked on both sides so it is visible when ejection port dust cover is open or closed. Ejection port cover is permanently marked Freedom Facilitator USA Flag on both sides so it is visible in open or closed position. Ejection port cover is permanently marked with hog in the scope reticle on both sides so it is visible in open or closed position. Ejection port cover is permanently marked with Jolly Roger Pirate with eye patch on both sides so it is visible in open or closed position. Ejection port cover is permanently marked with wavy USA flag on both sides so it is visible in open or closed position. "Lucky Dice" and "Make your won luck" is laser marked on both sides so it is visible when ejection port dust cover is open or closed. Laser marked Para Bellum on both sides so it will show when open or closed. Ejection port cover is permanently marked POW MIA on both sides so it is visible in open or closed position. Ejection port cover is permanently marked with a prairie dog in the scope and .223 on both sides so it is visible in open or closed position. "Sling Lead" and empty cases is laser marked on both sides so it is visible when ejection port dust cover is open or closed. 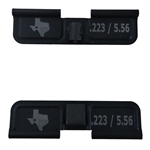 Ejection port cover is permanently marked with State of Texas and .223 / 5.56 Ejection Port Cover on both sides so it is visible in open or closed position. Ejection port cover is permanently marked with USA state flag and .223 / 5.56 on both sides so it is visible in open or closed position. Ejection port cover is permanently marked with a USA Flag and 300 AAC on the right on both sides so it is visible in open or closed position. 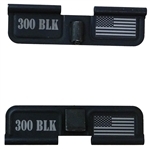 300 Blackout and USA Flag laser markings are on both sides of the ejection port cover. It will show when the ejection port cover is open or closed. Ejection port cover is permanently marked on both side so USA Flag on left 7.62 X 39 will show when cover is open or closed. 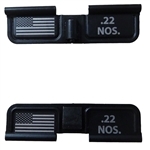 Ejection port cover is permanently marked with Wavy USA Flag and .223 / 5.56 Ejection Port Cover on both sides so it is visible in open or closed position. A zombie hand and Zombie Control is laser marked on both sides so it is visible when ejection port dust cover is open or closed.